Normally, a web server returns an entire report to a browser. The browser waits until it receives all of the report before displaying it. On-demand paging allows you to download one page of a report that is up to 99999 pages long to a browser instead of downloading the entire report at once. The web server holds the remaining pages until the user requests them. This feature shortens the time the user waits to see the first page of a report. It is especially effective for long reports. On-demand paging is implemented in the WebFOCUS Viewer. It requires that report output be formatted as HTML, which is the default setting for a request submitted through the WebFOCUS Client. The following is a report displayed in the WebFOCUS Viewer. When you run a report designated for On-Demand Paging, the Viewer opens automatically and displays the first page of the report. The Viewer consists of two panes: the Report Pane and the Viewer Control Panel, as shown in the following image. The Report Pane is the larger pane and contains one page of report output. When you first run a report, the Report Pane contains the first page of report output. The Viewer Control Panel contains the controls that allow you to display specific pages, deliver the entire report to your web server, and search your document for particular strings of information. Disables on-demand paging. downloads the entire report to a standard browser window. OFF is the default value. Enables on-demand paging. downloads the first page of a report to the browser in the Viewer. The number of lines displayed at one time depends on Windows desktop settings (resolution). The procedure and launch page for this example are run in . They must be tested and run in this environment. 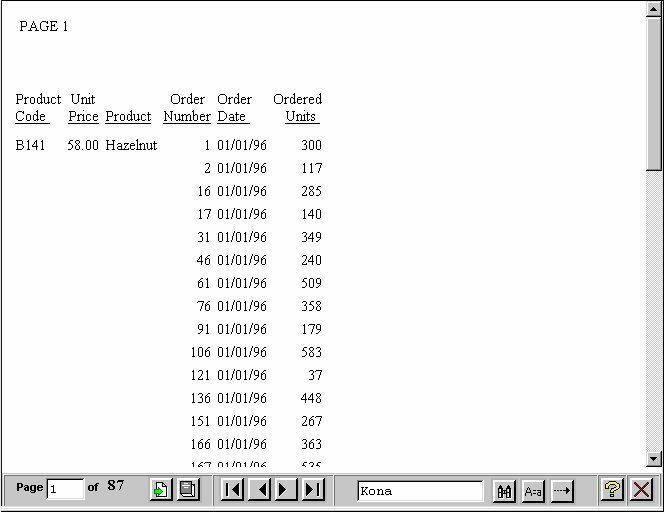 Create a procedure named ONDEMAND, which displays an order report for a store in the Viewer. Run the launch page, and click the link. The report displays in the Viewer. You can specify a target frame in which to open the Viewer, and a home page that displays when you close the Viewer. Opens the Viewer in a new browser window. This is the default for reports that do not have accessibility enabled. Opens the Viewer in the same frame as the anchor. Opens the Viewer in the immediate parent frame that contains the anchor. Opens the Viewer in the current browser window. Opens the Viewer in the frame from which you ran the report. This is the default for reports that have accessibility enabled. Is a valid URL that displays an HTML page when you close the Viewer. Displays a blank browser window when you close the Viewer. You must enter another URL to run another report. OFF is the default value. If you set WEBVIEWTARG to _blank, the window that contained the Viewer is removed. The browser does not display any page in any frame, and the WEBVIEWHOME setting has no effect. If you set WEBVIEWHOME to a URL, the browser displays the page associated with the URL in the frame that the Viewer occupied. If you set WEBVIEWHOME to OFF, the browser displays a blank page. You can issue commands that specify whether the Viewer displays the Close, Help, and All Pages buttons. Displays the Close button. ON is the default value. Does not display the Close button. From Internet Explorer, click the Tools menu and select Internet Options. From the Temporary Internet files box, click Settings. Click the Every visit to the page radio button. Click OK to apply the change and exit the Settings dialog box. 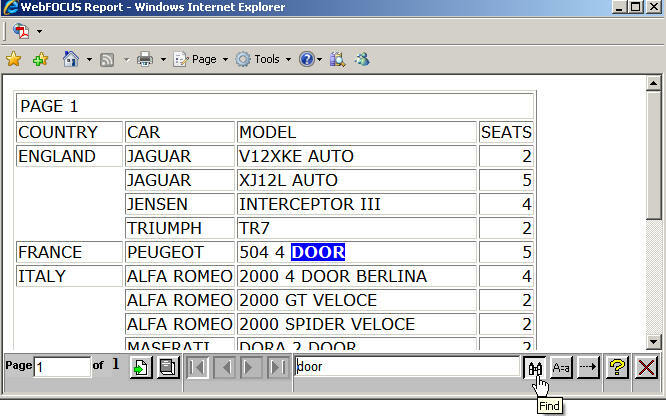 The Viewer Control Panel, as shown in the following image, (located at the bottom of the window) contains the controls you use to navigate through the report and to search for a string in the report. The Viewer Control Panel navigational controls allow you to display the next or previous page, the first or last page, or a specific page. You use the searching function to have the Viewer locate a search string you specify within all report pages. Note: When specifying a search string, you must specify the actual number of spaces between characters because HTML displays a single space, even when multiple spaces are used between characters. Enter a page number in the Page input box, as shown in the following image. Click Go to Page, as shown in the following image. To display the previous or the next page in sequence, click Previous or Next, as shown in the following image. To display the first or last page of the report, click First Page or Last Page, as shown in the following image. To download the entire report to the browser as a single document, click All Pages, as shown in the following image. To close the Viewer, click Close, as shown in the following image. To perform a case-sensitive search, click Match Case, as shown in the following image. To search backward in a report, click Search Backward, as shown in the following image. To locate a specific string, type the string you want to search for and click Find, as shown in the following image. Enter the string in the Search input box. Click Match Case if you want to perform a case-sensitive search. Notice that the Viewer displays the Match Case button with a red line across it to indicate that it is active. Search Backward to search for the string from the current page back to the first page. Find to search from the current page to the end of your report. The Viewer searches the report, underlines the first occurrence of the string, and opens the display to the top of the page on which it appears. If the underlined occurrence of the string is not visible, scroll down the page until it appears in the window of the Viewer. Click Find again to search for another occurrence of the string. You want to use the Viewer Control Panel to navigate a long report called Coffee Sales to find occurrences of the string "Kona," a type of coffee that you sell. After you run the report, displays the first page of the report in the Viewer. 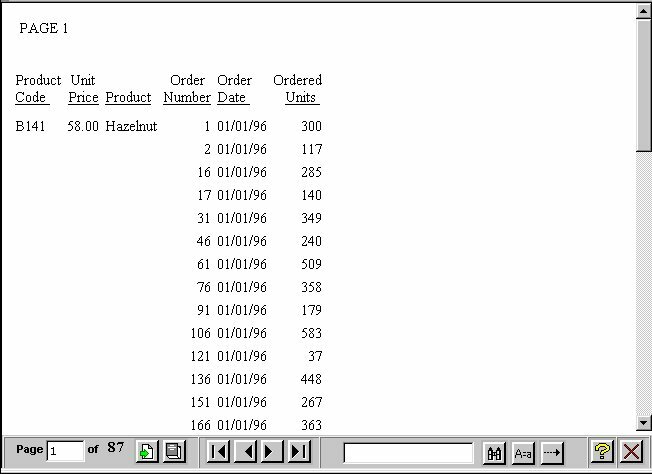 To search for sales of Kona, type Kona in the input box and click Find, as shown in the following image. The Viewer returns your report with the first occurrence of your search string underlined, as shown in the following image. Click Find again to locate the next occurrence of Kona. 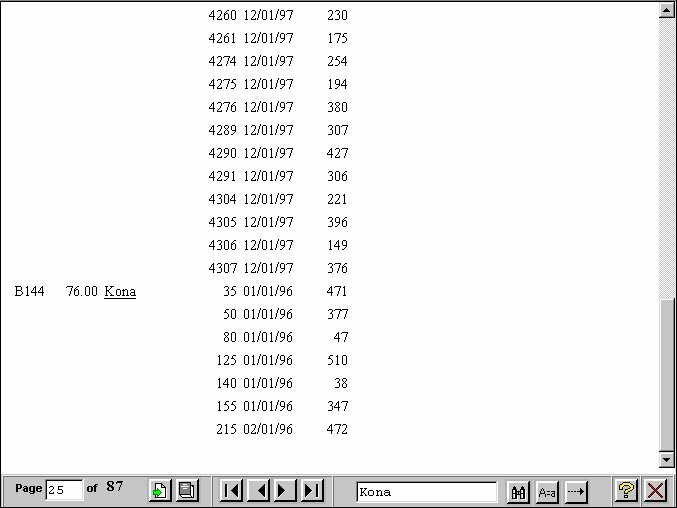 The WebFOCUS Viewer searches the report and underlines the first occurrence of the text string found. You may customize the search results by applying a Cascading Style Sheet (CSS) with a color and/or style defined. Open a new text file by using a third-party text editor, such as Notepad. In the CSS example code above, underlined text in the body of the report will be changed to set the background color to Blue, set the text to bold, and set the text color to White. Save the file as a Cascading Style Sheet (.css). Note: Type .css as the file extension. For example, findcolor.css. The location in which to save the CSS file depends on the WebFOCUS environment you are working in. Note: CSS files are accessed from a web accessible location. For WebFOCUSinstallations, the /ibi_apps/ibi_html alias is a location in which web accessible content can be stored. Open your report in InfoAssist, or the Text Editor, and apply the Cascading Style Sheet. For information on InfoAssist, see the WebFOCUS InfoAssist User’s Manual . Note: Fully qualify the URL to the CSS file when the CSS file is located on a different web location than the WebFOCUS environment you are running the report from. For example: CSSURL=http://hostname[:port]/ibi_apps/ibi_html/findcolor.css $, where hostname[:port] is the host name and port number of the web or application server the CSS file is accessible from. Enter the string in the Search input box and click Find. The WebFOCUS Viewer searches the report and highlights the first occurrence of the string found in blue. In the example below, a report using the findcolor.css Cascading Style Sheet file searches for and finds DOOR by highlighting the word in blue. You must clear the browser cache before printing a report locally using the Print button on the browser toolbar. You must also activate the window by clicking it before using the Print button. Use the procedure that applies to your browser to clear the cache. On the General tab, for Temporary Internet Files, select Delete Files.